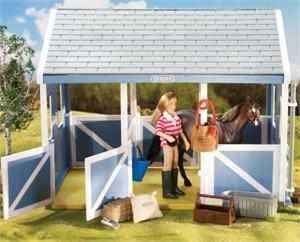 Add a customized finishing touch to any model horse, just like in the real show ring! This fun play accessory includes: Breyer Classics Size tack trunk, bucket, grooming tote, paint brush, stencil, washable glitter paint and treat tub. The Show Grooming set offers a large variety of items to offer hours of imaginative and pretend play.